When will I get my order? : Orders are processed in 4 business days. Then refer to this map (Click here for map) to calculate the additional shipping time. Your favors ship from Massachusetts. 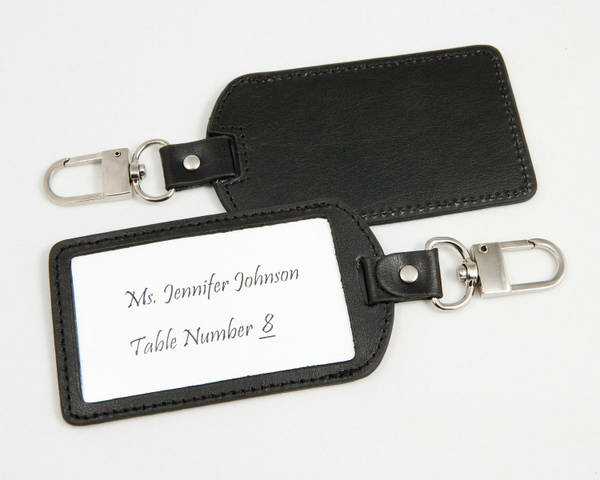 Your hunt for unique place cards is over with our black leather luggage tags. Attach them to a backpack, suitcase or purse. Use them to hold a photo and attach them to a key chain..So many uses. 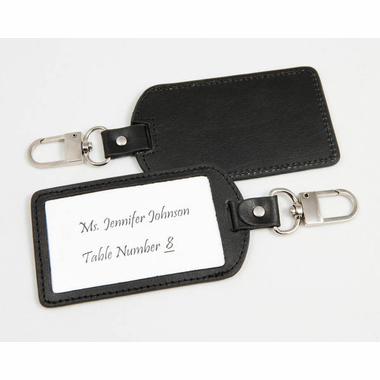 The silver swiveled clasp is so easy to you and beats luggage tag straps. This is the ONLY item that my product photographer asked to keep after he shot the image. It is still on his photo bag with a business card inside. Order a Sample for $10 which includes the price of UPS shipping.